Today I’m collaborating with 6 other awesome bloggers. 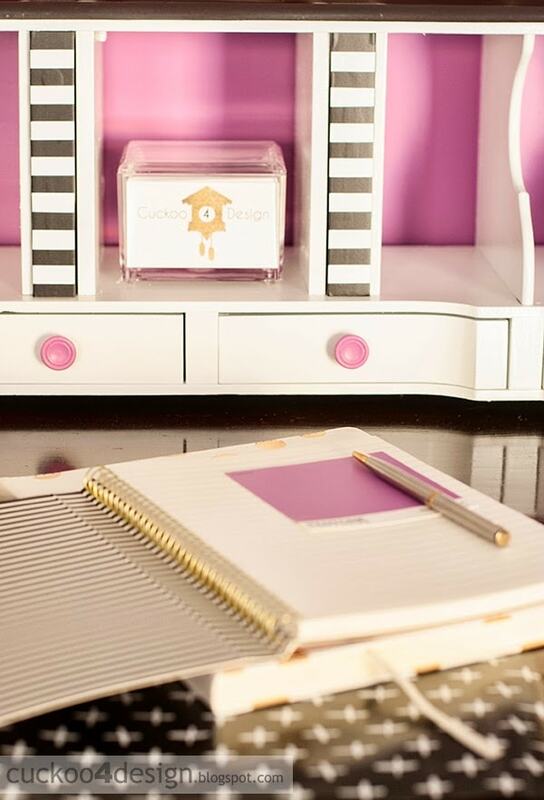 We are each sharing a “Radiant Orchid” (Pantone Color of the Year) project. 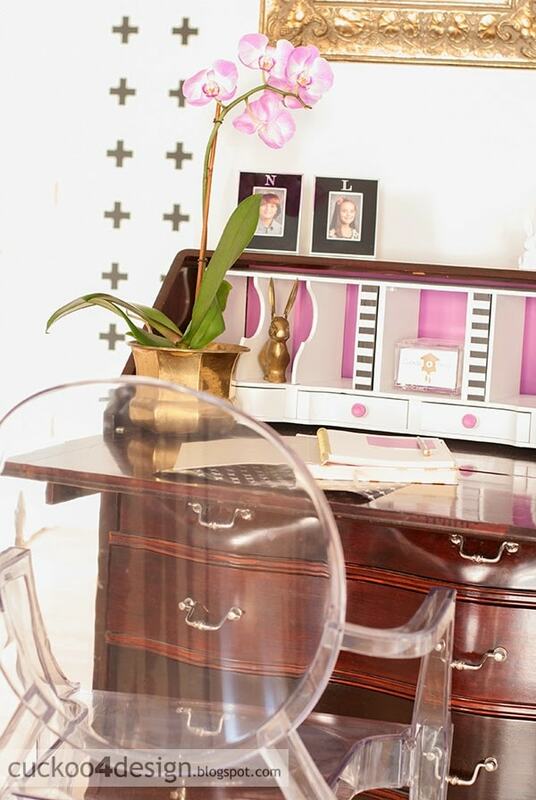 I chose to do my secretary desk (click HERE to see how I restored it). It has bored me for a while now, because in my eyes it just lacked something. So why not radiant orchid right? I have always liked this color and I’m totally aware that it’s not everyone’s cup of tea. I happen to love orchids and the dark pinkish-purple ones are my favorite. 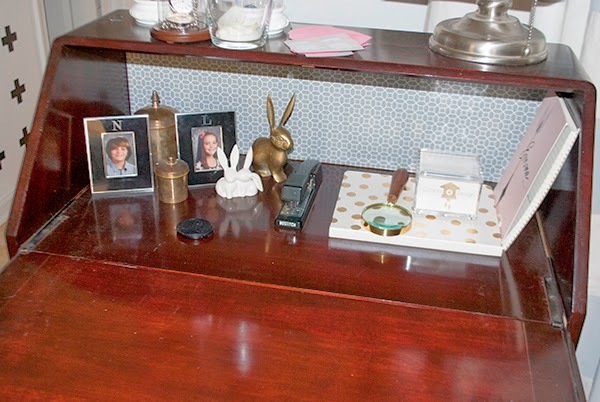 And here is a more recent photo of the desk since I changed the inside to green (click HERE). Ok but boring (and dusty)!!!! 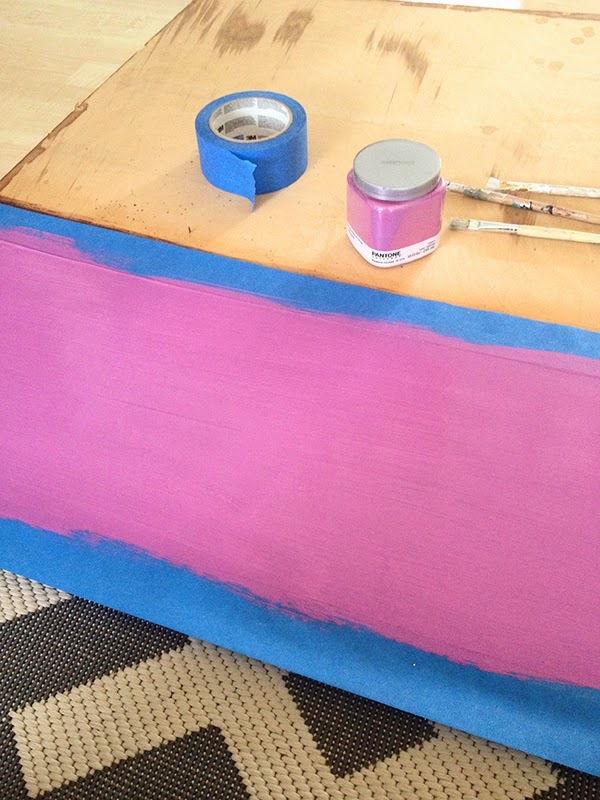 I took the back of the desk off, taped it and painted it with the radiant orchid that I bought at Lowes. And this is also the first time I got to try out this special little gadget that was sent to me. You know how frustrating it is when you are working on a painting a project and your little ones want food or drinks or who knows what else. Or when you are waiting for the first coat to dry? You simply stick your wet brush in the container and take it out when you are ready to use it again. I kinda really like it. I used to take zip lock bags or aluminum foil but I’m all for not creating more trash and cleaning things instead. So this is a great solution. Then I went into the attic and retrieved the desk insert that I had stashed away because I didn’t want to use it. Well I changed my mind. 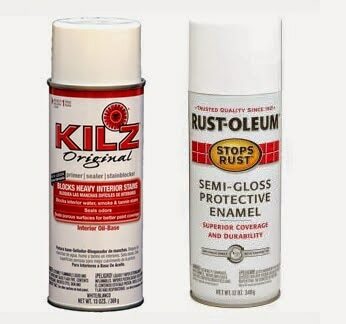 After giving it a good cleaning and two coats of my absolute favorite KILZ spray primer. I gave it a fresh coat of white semi-gloss spray paint. 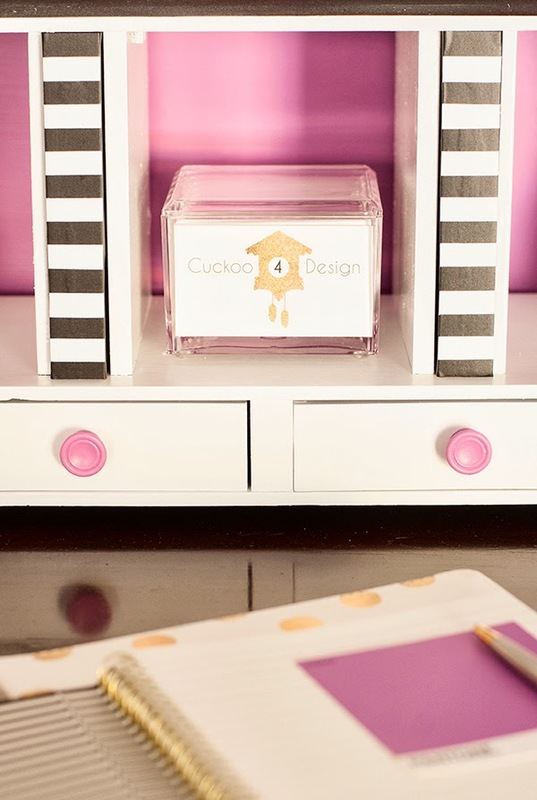 I also painted the knobs radiant orchid and used some leftover black and white wall vinyl strips to create the stripes on the little secret compartments. And voila…I really love it. It’s one of those things that makes me happy. Cheerful and bright! Totally not boring anymore. Enjoy! Don’t forget to stop back on Friday for another pet series post. i think that color looks like it was meant to be there! it looks gorgeous, my friend!!! So cute Julia and I always love your attention to detail. 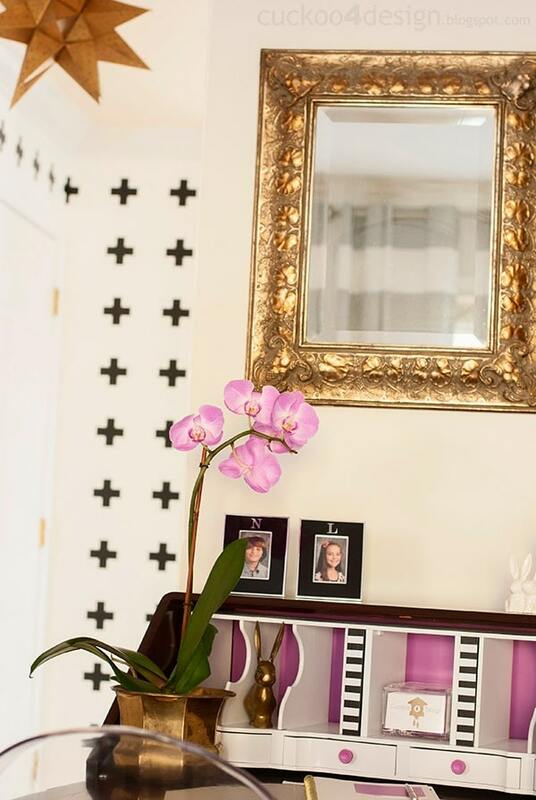 The actual orchid is gorgeous and I love you ghost chair too. I am definitely headed to The Container Store to get that acrylic box 🙂 And I can’t wait to try those paint brush covers! I was SO excited when Emily A Clark posted about them! The colour looks great. The desk insert with the new colours gives the desk a lot more interest. Lovely! Julia this is a fantastic pop of fun and color inside an otherwise traditional piece! I agree that something was missing and this project completely finished the piece. Love your styling, too! LOVE this! I have a secretary desk that was my husband’s grandfather’s which his mother painstakingly stripped and refinished years ago. I have always wanted to do something to it but did not want to offend her…. I am so doing this, it’s the perfect solution. and yours in radiant orchis is to die for, well done! This is lovely! And your styling is so fabulous. 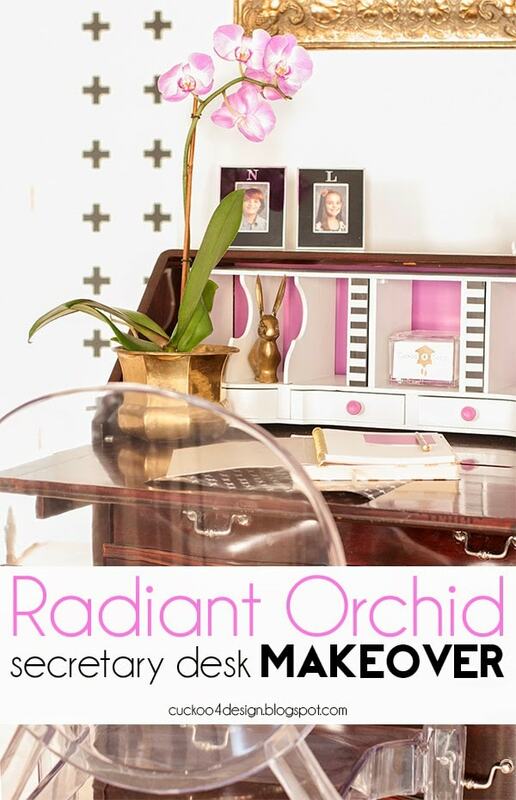 I obviously was a little liberal with my interpretation of “radiant orchid” and didn’t get the exact color 🙂 It adds so much interest to that desk and just rocketed it from a straight up vintage piece to a perfect old/new mix. Beautiful work! OMG..That’s amazing! Love it. Whatever you touch turns to beauty!!! 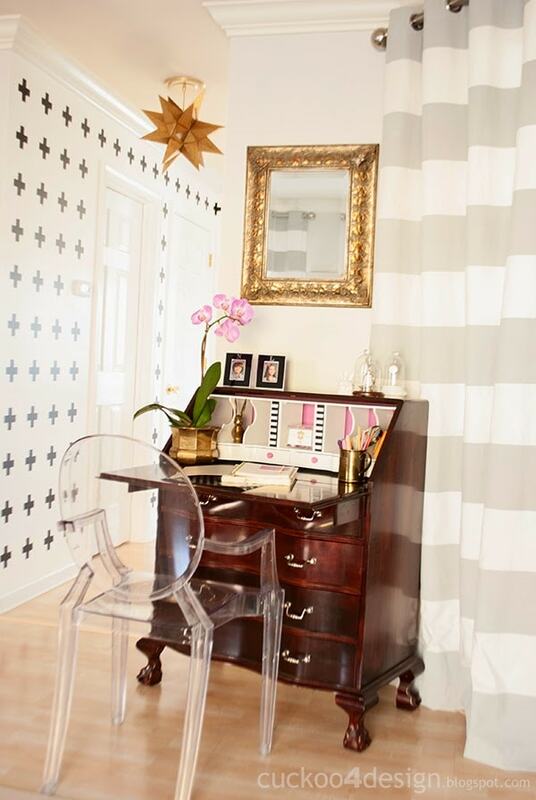 So fun and cheery! I love it! Where did you get the acrylic business card holder? This is perfect! Love the little surprise when you open the desk, and even though it isn’t my favorite color, I can totally appreciate it in little touches like this! I love the styling as well! Love how playful it feels! How awesome is this?! 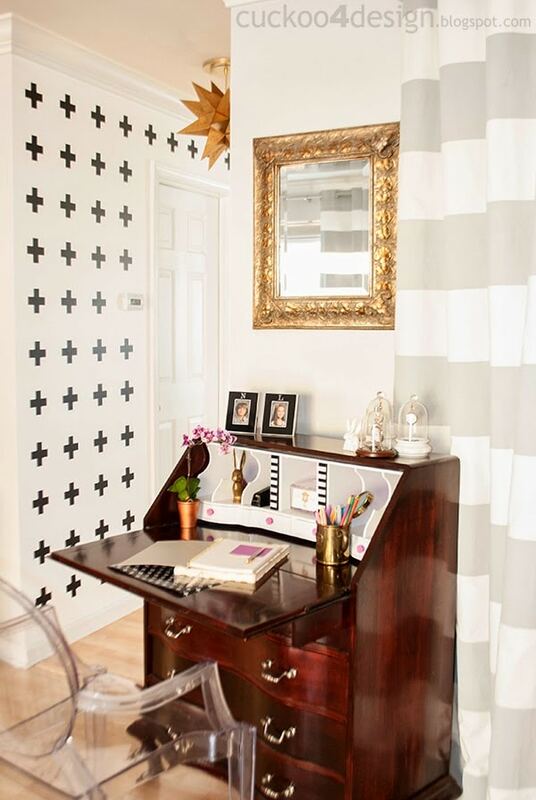 I love how you have a fun pop of color with the traditional desk…such a great and unexpected combo! Love the little pop of color! It definitely adds a little something-something. I love that you actually have an orchid in that color!! 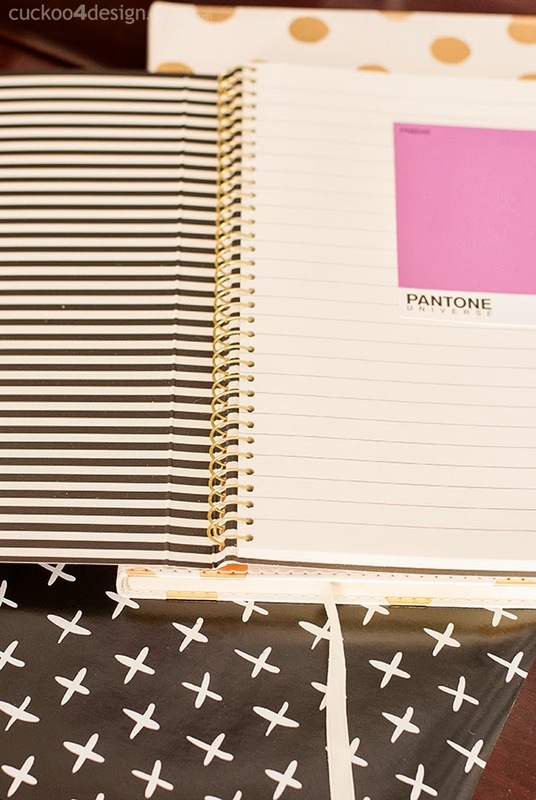 The pops of pink are a really fun surprise for that secretary! What a fun pop of colour to an otherwise traditional piece. So clever Julia! It is lovely Julia! I love that you just added small doses of Radiant Orchid. Before I clicked on the full post I had visions of an entire secretary painted that color! What a fun project to collaborate on! Oh you are so clever!! I love it, and that it’s so easy to change up when you’re ready for something new! So pretty! You are so creative, I love all of your projects. 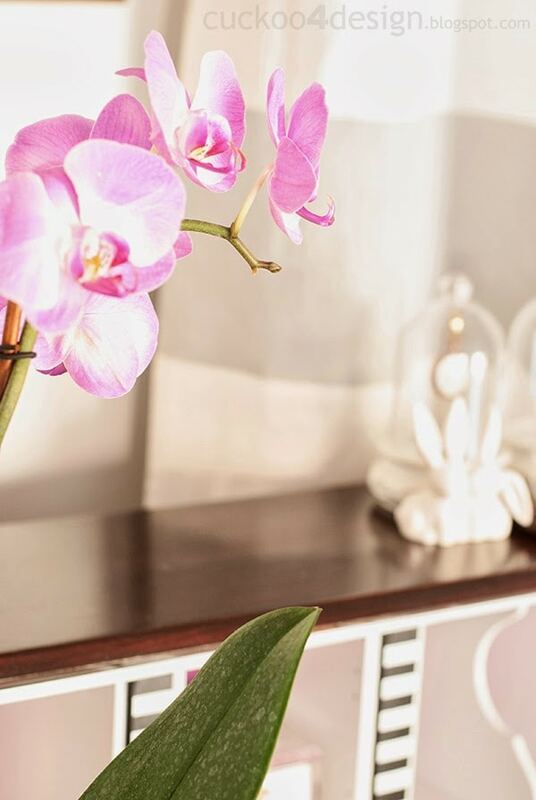 This color is so perfect for all of your beautiful orchids! 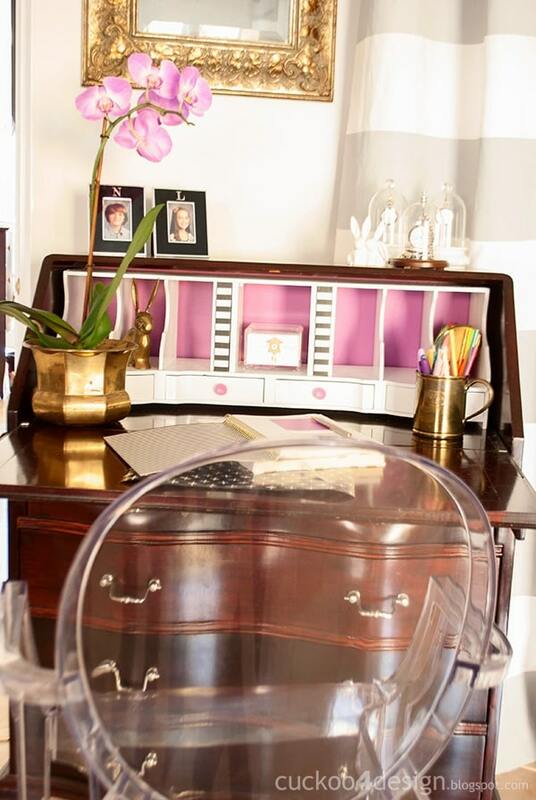 I love that little surprise inside your secretary. Great project, Julia! Ok seriously shut up!!! Honestly I’m not a fan of the color and all these projects are so good but seriously it’s like this color was just waiting for your secretary!!!! Looks awesome! 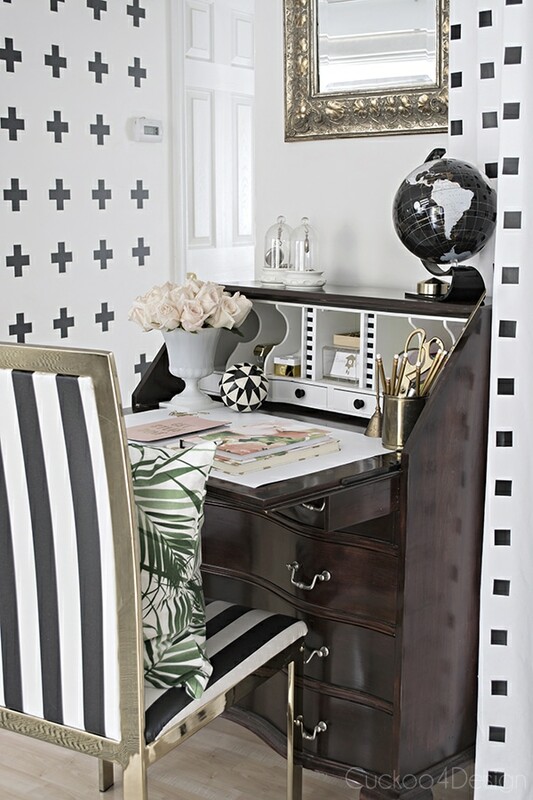 Julia, I love this surprise pop of color in this desk! Love the way this turned out! That color looks great in your home! It’s so pretty and so you! 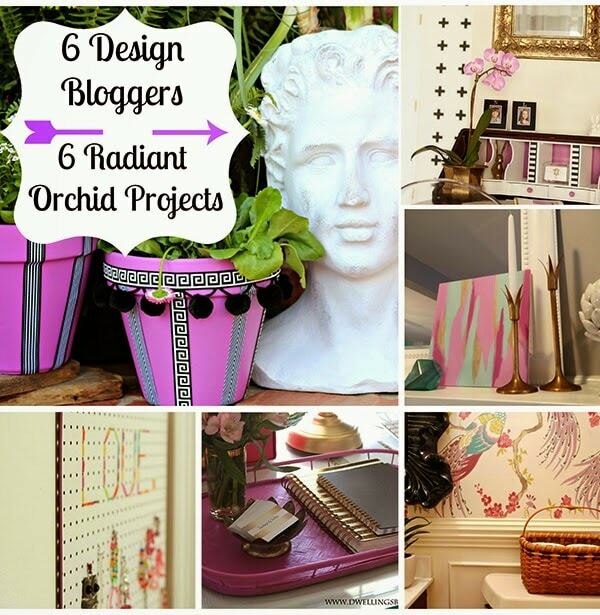 I’m pretty sure radiant orchid would only be allowed in my craft room or closet. I love the white and the Radiant Orchid together. 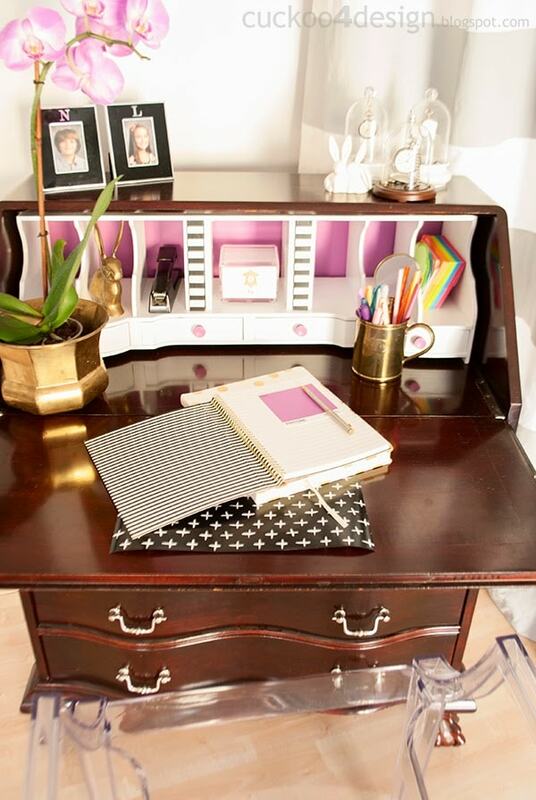 It’s just what the desk needed–so pretty! That’s a great color combination. Lovely. So pretty! 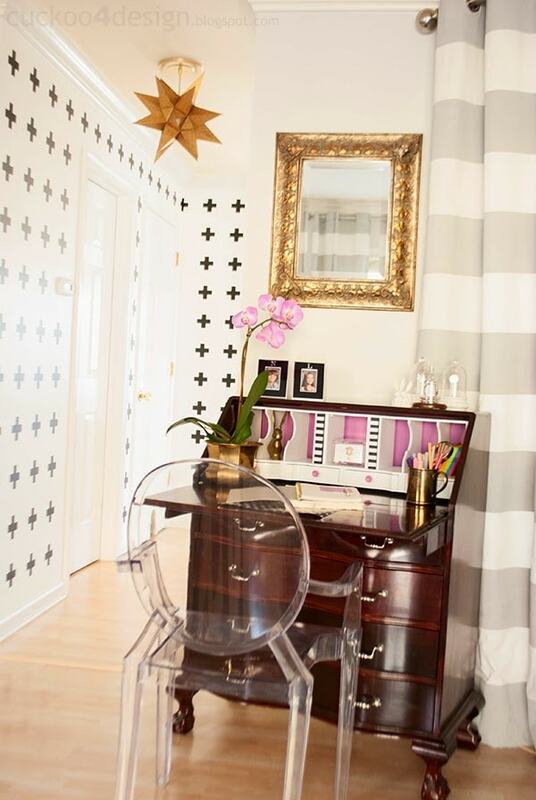 Love the pops of color! Great job – looks really good. 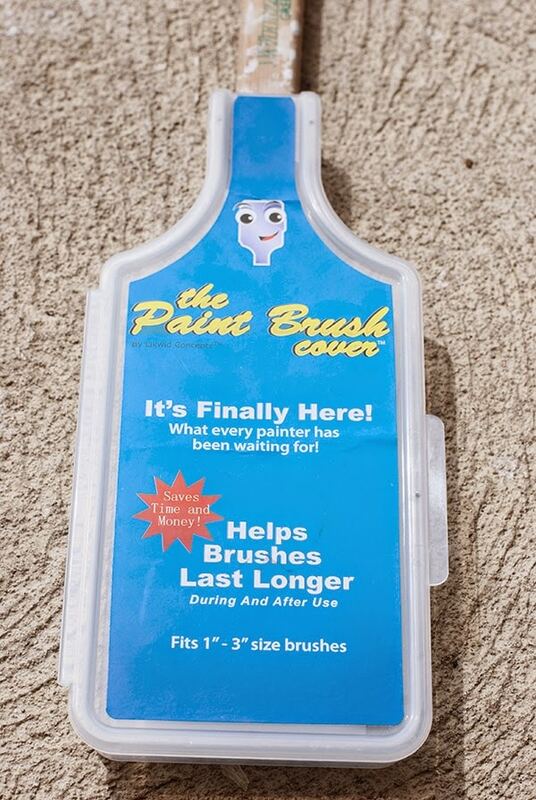 I was happy to see the use of the paint brush cover – the guys that developed this were on Shark Tank this past Friday night. They are so cute and 100% NYC guys. I was very impressed if it really works that well and you just confirmed it. Thanks for sharing. Such a beautiful job! I’m not a huge fan of purple but this is perfect! It looks so great with all the black and white in the hall and that insanely rich wood tone! Gorgeous! I love that pop of color! What a pleasant surprise! What a great makeover Julia! I love that it’s not in your face but just a nice little pop of color!